Mahindra has officially teased the Mahindra Mojo UT300 through its Facebook page. The teaser shows the bike’s silhouette overlapping on the rural and urban background. Going by the post, Mahindra seems to target urban customers who want an affordable but capable tourer. A walkaround video of the Mahindra Mojo UT300 surfaced recently. The bike is reportedly open for booking at select dealerships. The UT300 is essentially a less-expensive version of the standard Mojo. It loses out on the upside down front fork in favour of a more cost-effective telescopic fork. The LED DRL is gone, but the twin halogen headlamps are still present. The raised handlebars and wider pillion seat will improve the comfort factor. The Mahindra Mojo UT300 employs a carburettor for fuel supply, instead of the fuel injector. Expect a marginal drop in power and torque figures. The standard Mojo makes 27 PS and 30 Nm from its 295 cc DOHC mill. The gearbox is a 6-speed unit. The exhaust system is a single unit instead of the twin cans in the standard Mojo. Though the UT300 comes with cost-effective changes, it retains the familiar form of the standard Mojo. In the UT300, the alloy wheels are shod with MRF tyres, with 140-section rear. The rear uses a monoshock. Brakes include petal front disc and a single disc at the rear. 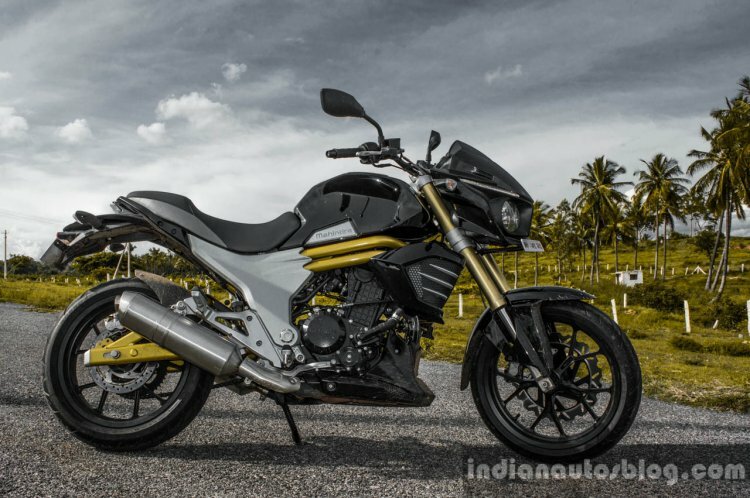 The bike is likely to use the same 21-litre fuel tank which the standard Mojo has. Key rivals include UM Renegade Sports S, and the newly-launched Royal Enfield Thunderbird 350X.